My name is Scott Strzelczyk and I am a Maryland citizen and resident of Carroll County. My testimony today is in support of House Bill 558 – The Liberty Preservation Act of 2013. This issue is not a Democrat or Republican issue. It is not a conservative or liberal issue. It is not a right or left issue. It’s a wholly American issue just as mom and apple pie. Throughout the history of our Union, States have interposed and nullified federal laws and acts that are not made in pursuance of the federal Constitution. When Congress passed the Sedition Act making it a crime to criticize the federal government, and President John Adams signed it into law in 1798, James Madison argued that “in case of a deliberate, palpable, and dangerous exercise of other powers” not delegated by the Constitution, the States “have the right, and are duty bound, to interpose for arresting the progress of the evil”. These rights enshrined in the Magna Carta are part of English Common Law. We know that Common Law was adopted as of July 4, 1776 and is codified in the Maryland Declaration of Rights, Section 5a, subsection 1. The American Revolution should remind us that sovereignty is left in the hands of the people, and if the federal government should exceed its constitutional authority, abridge or deny our unalienable rights, the people and the States are duty bound to resist any and all arbitrary power and oppression. Today, you have the opportunity to stand proudly among some of the greatest state legislators in the history of the Republic. In the 1850s, northern state Senators and Representatives stood up for the due process rights of their black citizens and passed Personal Liberty Laws, blocking implementation of the Fugitive Slave Act of 1850. This act counts among the most evil pieces of legislation in American history. The Fugitive Slave Act of 1850 made a farce of due process, allowing for the arrest of a suspected runaway slave based on the word of the “property owner.” He simply had to swear an affidavit attesting to his “ownership” of the person in question, and he was allowed to drag that man or woman back South into slavery. The accused wasn’t even allowed to present evidence in his own defense. The act was meant to protect the “property” of slave holders, but many free blacks found themselves accused of escaping slavery and faced the prospect of living out their life on a plantation. And northerners understood that even an accused runaway should remain innocent until proven guilty, and enjoy basic due process rights. Would you comply with the Fugitive Slave Law or would you resist it, and interpose on behalf of your citizens? This week marked the 71st anniversary of Franklin Roosevelt’s signing of Executive Order 9066. The order authorized the Secretary of War and the U.S. Army to create military zones “from which any or all persons may be excluded.” The order left who might be excluded to the military’s discretion. Roughly 120,000 Japanese Americans were rounded up and sent to internment camps. Of those 62% were American citizens. Roughly 11,000 German Americans and 3,000 Italian Americans were also rounded up. Recently, Washington State Senator Bob Hasegawa shared his emotional and traumatic story of how his parents, grandparents, aunts, and uncles were detained and spent three years living behind barbed wire and armed guards at the Minidoka Internment Camp in Idaho. They were all U.S. citizens and they were all denied due process. They were detained solely for being of Japanese descent. Certain sections of the National Defense Authorization Act empower the federal government to indefinitely detain citizens without due process, without being charged with a crime, and without a trial by jury. How are these parts of the NDAA any different than the Fugitive Slave Act of 1850? How are these parts of the NDAA any different than the Executive Order President Roosevelt signed? In nothing more than a stroke of the pen, a thousand years – a millennium – of due process rights are obliterated. You either believe in due process for all persons or you do not. It is unjust and discriminatory for legislators, executives, or the judiciary to deny due process rights to any person. Let me start off by sharing a story. On Sunday, two days before the election, I was in line at the grocery store and overheard the cashier talking to the customer in front of me. She said “well I hope things work out the right way on Tuesday”. Now, I don’t know what the right way meant, but I did offer these words. No matter who wins the election on Tuesday, one half of the country will be happy and the other half will be disappointed. She agreed. Most people will agree with that statement. For those that believe the country is lost or we are well on the path to socialism you are wrong. The country isn’t lost now. We lost the country a long time ago. Today is the time to recognize and acknowledge the system is broke and broken. Today is the time to recognize the system is dysfunctional. Today is a time for reflection and introspection. This article summarizes my thoughts, my reflection on what transpired and where we stand as a society today. A presidency becomes imperial when it relies on powers beyond those allowed by the Constitution. The Constitution established three separate branches of government not for efficiency but to avoid the arbitrary exercise of power. The Constitution and its authors determined that the power to initiate a war belonged to the Congress. The President had the responsibility to conduct ongoing wars and ongoing foreign relations and respond to sudden attacks if the Congress was not in session. As the United States of America became a great world power, and then a superpower, the Presidency acquired more war powers despite the Constitution. This reduced the Congress’ powers and the separation of powers, which is necessary to avoid the arbitrary use of power. I cannot emphasize enough Schlesinger’s last sentence. He said, “These changes have occurred slowly over the centuries so that which appears normal differs greatly from what was the original state of America”. [Emphasis added.] He is saying the Constitution established a constitutional republic not an imperial presidency. He is saying the role of government and the authority of government has fundamental changed to a government without limits and a government that acts arbitrarily and capriciously. Smith continued on to the expanded powers of executive orders. Smith wrote, “Events since then (such as the invasion of Iraq in 2003) have revealed how far an Imperial President could go with broadly granted war powers, “presidential immunity,” “signing statements” (declaring which congressionally approved statutes he would ignore or refuse to enforce) and the increasingly popular “executive orders” which enable everything from imprisoning entire ethnic populations (E.O. 9066) to claiming extra-legal powers over the entire U.S. economy. I have said before we need to choose between uncomfortable truths or comforting lies. The latter is the rationalizations people go through to avoid uncomfortable truths; about themselves, our government, or society in general. In some cases these rationalizations amount to mental gymnastics to somehow, anyhow, maintain some semblance of reason and understanding today. The result is a normalcy bias where people simply cannot digest or understand what is happening around them, thus the need for mental gymnastics to catapult their minds back to a place they understand. Those are the comforting lies people tell themselves to cope with the unknown and unchartered territory we are headed into. The problem is exacerbated by rhetoric and fear. We are headed into unknown and unchartered waters. At least for us they are unknown waters. But these waters have been traversed before. History is replete with examples of great societies rising and falling. But do not believe for a minute that we are doomed. Contrast where we stand today with those that voyaged to America on the Mayflower. Undoubtedly, they truly entered unchartered waters. The risks they took were orders of magnitude greater than what we have to deal with after the 2012 election. That doesn’t mean things won’t be difficult as we all try to figure out how to navigate the choppy waters ahead and charter our own futures. Government debt will grow and deficit spending will continue. The simple truth is both Romney and Obama would continue government’s profligate spending and run annual deficits which increase the national debt. Albeit the amounts may vary slightly, but nevertheless, the path of fiscal insanity will continue. Today, government revenues are less than the total expenses for Social Security, Medicare, and the interest on the debt. 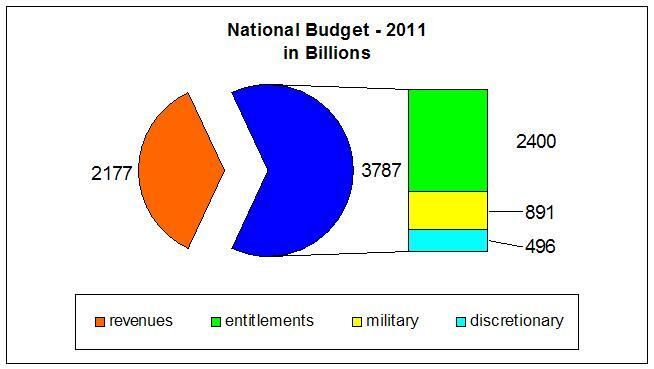 All discretionary (non-military) and non-discretionary (military) spending is funded through borrowing. By the next presidential election I expect the national debt to be between $20 trillion on the low end and $23 trillion on the high end. To fund their deficits, government will continue to borrow money and print money. Government will continue to debase the currency. I’ve written on this extensively and won’t cover it again here, but it is sufficient to say that the purchasing power of a dollar (spent now or savings spent later) will decline. Government securities that cannot be sold to foreign central banks, foreign governments, or the primary dealers will be bought outright by the Federal Reserve. Expect prices to rise and your stored purchasing power (i.e. your savings) to diminish. An interventionist foreign policy will continue. In addition to the unconstitutional wars U.S. involvement in other countries’ affairs will continue unabated. In some cases the U.S. will prop up foreign governments whether they are dictatorships or not. In some cases the U.S. will supply and arm insurgents to combat foreign governments because it’s in our national security interests. All will be justified under the guise of “national security” or our “national interests”. The entitlement state would continue unabated. Neither Romney nor Obama has any plans to reduce or eliminate entitlement programs. This is how I describe the system to people. The government confiscates your earnings through a tax and places into a “trust fund” with the Treasury Department. The trust fund is raided so the current government can spend it and is replaced with an I.O.U. The money is spent on wasteful and unconstitutional government programs. Eventually it is replaced by borrowed funds which the government says you have to repay and with interest. This is referred to as a Ponzi scheme. The system is unsustainable and government uses its enforcement arm – the IRS – to ensure you comply and participate in the scheme whether you consent or not. The welfare state is a source of votes for politicians. In a quid-pro-quo the agreement is we will provide a “government benefit” such as EBT cards, housing, etc. and in return you vote and keep us in power. In other words, the people are voting themselves largesse out of the treasury. But that largesse comes from a source other than government. It comes from taxes or borrowing. In one case the rightful property of one person is taken by government and provided to another that has absolutely no rightful claim to it. In the case of borrowing, this is more of the same problem where the debt is increased and you are expected to repay the principle and interest out of your future earnings. Unalienable rights, liberties, and civil rights will continue to be abridged or denied. Decade after decade the erosion of our rights and liberties continues unabated. Asset forfeiture laws, traveling on airplanes, parts of the Patriot Act, parts of the National Defense Authorization Act, and unlawful violations of the 1st, 4th, and 5th amendments continue unabated. Usurpation of power by Congress, the executive, and the judiciary is considered normal behavior where it was once considered treasonous. States no longer exercise their constitutional authority by checking the powers of the federal government. States have been reduced to mere satellites, mere corporations, to the leviathan occupying the ten square miles known as Washington D.C. with its tentacles reaching out to every state, county, municipality, community, neighborhood, and home across our great Union. All will be done under the guise of “keeping us safe” or “we are doing it for the kids”. The unfunded liabilities of the federal, state, and local governments combined exceed $200 trillion. We haven’t had a free market economy in generations. Today we have a centrally planned economy where the state controls the money supply, the cost of money (interest rates), and forces people to use fiat currency through unconstitutional legal tender laws. The state redirects capital towards government centric preferences. Supply and demand is distorted. Price signals are manipulated through government intervention. Scarce resources are misallocated primarily for political purposes. Economic figures and statistics are adjusted and manipulated by government bureaucracies for political purposes. GDP, CPI, unemployment and other figures are routinely manipulated for political purposes. Taxes are primarily paid by the top 25% of earners. The bottom 50% of earners pay no federal income tax. Estate taxes prohibit family owned businesses from passing on from one generation to another. Corporate taxes are a farce. Corporations don’t pay taxes, people pay taxes. Income taxes are another expense item for a corporation which they pass on to the consumer in the price of the good or service provided. There are hundreds of other taxes and fees paid at the federal, state, and local levels. These are the uncomfortable truths. These things would continue regardless of who occupied the White House. What is important is what to do next? As the size, scope, and authority of the federal government expands, and the debt continues to grow, and the currency continues to be debased what should we do next? What can you do to insulate yourself and better secure your unalienable rights from the leviathan’s tentacles? 2) Your neighborhood and community. 6) Your network of like-minded people. Recently, Hurricane Sandy hit the mid-Atlantic coastline and there are still many people without food and water, shelter, or electricity. The government is ineffective in these situations. People suffer. People die. People that look to and depend upon government to rescue them, to support them through so-called government programs, to provide for their retirement or medical care, and many other things must face some uncomfortable truths. The government can’t rescue or save you. The government cannot be the answer for your everyday needs in life. The government cannot provide a cradle-to-grave life for you. The government cannot provide spiritual guidance. This is nothing more than a comforting lie which allows you to ignore reality; to ignore the uncomfortable truth that there are risks and rewards in life. That failure is an option. Success is an option. Your choices are yours and yours alone to make. And, you live with the consequences of your choices. To live in a government imposed and controlled society where choice and individuality is limited, where success is punished, and failure is rewarded is to ensure a constant, pleasant Prozac-like state of mediocrity. It ensures that no individual is unique or different. Rather, nobody is special and we are all mere cogs in government’s machinery. It is to live in peaceful slavery as you and your fellow man battle with others in society for the crumbs tossed your way by government masters. This is wrongful liberty and certainly not how free people live. The answers must come from us. We must build a firewall between ourselves and the federal government through local and state solutions. We must reclaim responsibility for our lives, our liberty, and our property. We must reclaim our virtues and not allow government to dictate what is or isn’t virtuous. We must recognize the smallest minority in the country is the individual. Each individual must exercise rightful liberty to unobstructed action within their own will drawn around the equal rights of others. Not to exercise superior rights over others or to have others exercise superior rights over you. Not to have a government use the brute force of institutionalized state violence to exercise superior rights over you and obstruct your actions. Not to decide winners and losers in life or in the economy. Not to create a dependent society demanding, by right or precedent, free things from government. Rather to create an environment, a condition of rightful liberty where each person’s choice of unobstructed action allows them to obtain goods and services they want or need. Changes indeed have occurred slowly over the generations and have reached a point where America is no longer recognizable. I encourage each of you to take some time after this election and genuinely reflect about these things. Cast aside political parties and propaganda, rhetoric and fear, and free your minds to consider your future and the future for your posterity. God Bless. An impartial, objective analysis of government programs that have the word “public” pre-pended to the program are abject failures. The purpose of this article is to analyze three government programs; public housing, public education, and public assistance. The evidence overwhelming supports these government programs are abject failures. Furthermore, if the Patient Protection and Affordable Care Act, colloquially referred to as ObamaCare, is implemented expect that program to be an unmitigated failure as well. How did we get here? Husock says that three “remarkably tenacious” myths perpetrate the government as “houser” argument: 1) the market will not provide housing for the poor; 2) by taking the profit motive out of the equation the state can do better than small property owners in providing housing; and, 3) the moral qualities of the poor are a product of their housing environment. Eliminating the profit motive from the equation is eerily similar to the arguments for health care reform and the public option. The government incorrectly and brazenly assumes that as a non-profit provider of goods and services they are more competitive than a private insurer, and better suited to meet the needs and demands of the consumer or marketplace. The government interjects itself as housing provider, subsidizer, landlord, and property management company. Public housing results failed miserably to meet market needs, reduce costs, or eliminate poverty. Furthermore, specific government intervention through the Community Reinvestment Act and government sponsored entities (GSE) Fannie Mae and Freddie Mac were culpable in the sub-prime mortgage debacle in the housing market which greatly contributed to the financial industry problems in 2008 and the current economic situation. Government mandates placed upon lending institutions modified industry business practices that required down payments, decent credit, and verifiable income from mortgage applicants. Instead, the mandates forced lenders to provide sub-prime loans to unqualified applicants. Fannie-Mae frequently bundled those loans and sold them to investors; which in turn used them as collateral against other securities. All perfectly legal, and under the careful and watchful eye of numerous Congressional committees and federal agencies, led the housing market and the economy into a free fall. All these well-intentioned regulations resulted in numerous unintended consequences. Fourth, a Department of Education will save tax dollars. By eliminating bureaucratic layers, the reorganization will permit direct, substantial personnel reductions. By enhancing top-level management attention to education programs, it will earn improved educational services at less cost. The budget appropriated for the Department of Education from 1980 through 2008 as well as the high school graduation rates are summarized below. Sources: National Center for Education Studies, Department of Education – Budget History Note: 2008 graduation rate is from 2006 as that is the last actual, non-projected year available. Any fair-minded person would generally accept high-school graduation rates as a reasonable barometer to measure the impact of federal government education spending. In 2000 constant dollars the Department of Education budget has nearly doubled from 29 billion dollars in 1980 to 55 billion dollars in 2008, while the on-time public high-school graduation rate is flat. According to the goals outlined in President Carter’s statement I categorically state they have not eliminated bureaucratic layers, they have not substantially reduced personnel, nor have they improved services at less cost. On a side note, the American Recovery and Reinvestment Act of 2009 appropriated an additional 98 billion dollars to the Department of Education. The major purpose of our association is not the education of children, rather it is, or ought to be the extension and/or preservation of our members’ rights. Undoubtedly, the only correlation between federal education spending levels and public high-school graduation rates is increased spending doesn’t improve graduation rates. Union leadership obstructs real meaningful educational reforms as the union’s primary objectives are counter to improving our children’s education. The political reality aligns union leadership with high-level government politicians and bureaucrats to control and define society through the auspices of better education for our children, while confiscating more of our hard-earned money. Quite simply, parents working within their local communities and states are better equipped to address educational needs and implement appropriate solutions. Lastly, there is the unconstitutionality of federal involvement in education, but that is an entirely beyond the scope of this article. There are 70 federal welfare programs across 14 different federal agencies (one of which was public housing). In fiscal year 2008, total government spending on means-tested welfare or aid to the poor amounted to $714 billion. This equates to roughly $16,800 for each poor person in the United States. Welfare spending was 13 times greater in FY 2008, after adjusting for inflation, than it was when the War on Poverty started in 1964. Means-tested welfare spending was 1.2 percent of gross domestic product (GDP) in 1965 and in 2008 it is 5 percent of GDP. Since the beginning of the War on Poverty, government has spent $15.9 trillion (in inflation-adjusted 2008 dollars) on means-tested welfare. In comparison, the cost of all other wars in U.S. History was $6.4 trillion (in inflation-adjusted 2008 dollars). Do not conclude that I support all war efforts just because I’m comparing public assistance costs to the cost of all wars. It is meant merely to be a point of comparison. Under President Obama, government will spend more on welfare in a single year that President George W. Bush spent on the war in Iraq during his entire presidency. While campaigning for the presidency, Obama lamented that “the war in Iraq is costing each household about $100 per month.” Applying the same standard to means-tested welfare spending reveals that welfare will cost each household $560 per month in 2009 and $638 per month in 2010. According to President Obama’s budget projections, federal and state welfare spending will total $10.3 trillion over the next 10 years (FY 2009 to FY 2018). This spending will equal $250,000 for each person currently living in poverty in the U.S., or $1 million for a poor family of four. Call me skeptical, pessimistic, or whatever you’d like, but centrally planned, government run social programs are abject failures. The evidence bears this out. This is why we must bind the federal government to its legitimate constitutional authority and return to federalism. The debate over a two percent reduction to the payroll tax rate is mind-numbing. The ruling class acts like petulant children who can’t play nice in the sand box. The ruling class once again uses the tax code to divide and conquer the people to satisfy their personal ambitions. Let’s put this into context. Assume an average annual income of $50,000 a year, a two month extension amounts to $167 which is just over $19 per week. What does $19 buy you? It buys about 6 gallons of gas, or 4 Chiptole burritos, or 2 large pepperoni pizzas for the family. It baffles me that both political parties and the lemmings in the main stream media focus on this issue as though it is the overarching issue of the day. The country is $15 trillion in debt. The government hasn’t passed a budget in over 900 days. Annual deficits routinely exceed $1 trillion. Unfunded entitlement liabilities exceed $100 trillion. The ruling class just passed a law that can detain American citizens indefinitely and without trial. Yet, the focus is on a two-month temporary tax cut that will not change the standard of living for a single person. The moral and philosophical aspect of this tax cut is even more disturbing than the inane debate. The tax cut represents a systemic problem germane to the tax code. The Lords of the Potomac use the tax code for personal political benefit. Individuals as well as special interests want to preserve their tax break, credit, or subsidy. Unfortunately, too many individuals vote for the candidate that promises them the most in return. A certain quid-pro-quo exists where large swaths of society pay no federal income taxes and/or receive certain benefits in exchange for their votes. Likewise, too many companies receive preferential treatment in the tax code or subsidies for certain activities and in return those companies, trade groups/associations, unions, or political action committees contribute to campaign coffers. Moreover, the tax code is used as political fodder to divide Americans. We often hear how the rich don’t pay their fair share, or there are tax breaks for this industry or that industry. The ruling class use envy and jealousy to appeal to the worst part of human nature in order to divide the people. Elected officials act despicably when they attempt to turn one person against another because one earns more than the other. Government attempts to legitimize the redistribution of property according to their personal preferences. Government punishes the person that earns more by taking more of their property and redistributing that property to special interests and others in society. Likewise, government rewards the person that earns less by giving them property they have no rightful claim to. The ruling class makes scapegoats out of the top 1% of income earners and demonizes companies that use tax breaks that the ruling class enacted in the first place. Conveniently, the ruling class forgets that nearly 50% of all federal income tax filers pay no federal income tax. This issue has nothing to do with being fair. The issue has everything to do with partisan politics, campaign fundraising, and getting re-elected to office. In short, it is merely about keeping the status quo. Too many Americans crouch down and lick the hands which feed them. By participating in this system, the people enable government to act as a proxy for them and engage in the legal plunder of those that produce; to punish achievement and success. The law’s intent was to protect individual rights, liberties, and property. The government has stood the law on its head and now uses coercion and the threat of fines and imprisonment to steal from one segment of the population. If the ruling class truly cared about the middle class keeping more of their own hard-earned money there are dozens of other actions government could undertake. One example is the elimination of corporate income taxes. Corporate taxes are an expense which is passed on to the consumer in the final cost of a product. Another example is a flat tax applied to all income and is paid on every dollar earned. Lastly, why limit the payroll tax cut to 2%? Why not eliminate it entirely so the middle class worker can keep an additional 4.2% of his hard-earned money? The simple truth is the ruling class doesn’t care about the middle class or any other part of society. The ruling class intervenes in every aspect of our daily lives and the economy as an excuse to pursue their own ambition and avarice at the expense of society. The 2% temporary payroll tax reduction is another opportunity for the ruling class to politicize an issue for their own benefit. The ruling class would have it no other way. This is just another example of the mind-numbing stupidity and insanity that is Washington, D.C.